Vinesh Saxena was born in small town (Bisauli) in U.P. India. He began his schooling- starting in grade fourth. He was the youngest in the family of three brothers, one sister, two stepbrothers and three stepsisters. His mother was the third wife of his father. Two previous wives had died. From the very beginning, Vinesh was a different child. He was always in a pensive mood, did not believe in having many friends or owing many worldly possessions. He remembers his father as a retired Government officer. His father owned a house and had a moderate income after retirement. This house was big with lots of rooms and large land infront with trees of Oranges and pomegranate. They also owned a big orchard of mango and guava trees. His father seldom showed a keen interest in bringing up his youngest son. Even when it was time to pay school fees, he always hesitated. There was an even incident in grade 4 when the teacher refused to issue his year-end report card. When Vinesh came home, he told his family that his father had not paid the fee therefore the teacher failed him. However Vinesh always remembers his father as a shrewd administrator and achievement oriented. He remembers when he asked his father to pay the air fair to Canada (Which was a real large some of money in those days) his father paid him the required amount. This further enhanced the “shrewd administrator figure” in Vinesh’s mind. Looking at the world around him Vinesh realized that in order to reach “somewhere” and attain his objectives he had to excel in education. This did happen. In high school Provincial examination he passed with honors and ranked seventeenth in the whole province of Utter Pradesh. This was first not only in his family but also in the town and his surrounding villages. 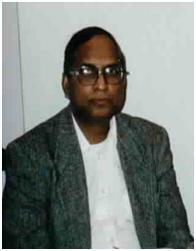 He earned Government Post Metric merit scholarship, which was given to only 200 students of whole India in 1959. This scholarship helped him to continue his education up to engineering. After doing his B.Sc. he appeared in entrance examination for engineering for Indian Institute of Technology as well as Roorkee University. He was selected for both; however he decided to go to IIT Delhi. His brother Mahesh Saxena (who is one of the Directors of this foundation) also provided support while he was in engineering. Subsequently he came twenty fifth in Utter Pradesh intermediate provincial board examination, ninth in B.Sc. from Agra University and third in IIT engineering from New Delhi. After doing his bachelor of engineering, he came to Canada and did his master of engineering at the University of New Brunswick. He earned an MBA from McGill University. He is also a member of Order of Engineers, the Chartered Management Accountants and the Society of cost engineers. He worked almost 25 years with Pratt and Whitney as engineer (Last position chief of engineering administration). He also taught part time at Concordia and McGill Universities. Mr. Saxena worked tirelessly, working full time, and teaching part time. He owned real estate and stayed active in financial markets all simultaneously. As far as recollecting some incidents from his life in India Vinesh recalls several. When he was selected for both IIT & Rurkee, he says that he will like to meet the person who went to the Rurkee University (because Vinesh did not join) and ask him for thanks at least. Vinesh also reflects about his disciplined life i.e. getting up every morning at 6 am, taking shower, yoga, meditation and preparing for the day without exception. At IIT Delhi he owned a bicycle which was a real luxury (in those days less than 5% students could afford bicycle in hostel). How could he afford? He recollects that in whole four years period he did not go to see a single movie in a movie theatre – instead that money went towards the purchase of bicycle. (Later on he coined this as ” the principle of replacement and sacrifice” as mentioned in his seven Principles). He says if he would had contacted the authorities, it would have been in Guinness book of world records that a student did not see a single film in a movie theatre that too in Delhi, the capital of India. He married a French Canadian. This marriage ended in divorce in 1989 due to basic differences. He has two children – Lisa and Denis from this marriage. Subsequently, he married Meera Trivedi in 1995 who helped him a great deal in realizing his objectives and starting this trust. She was working in the United States with the opinion to start a trust and give her house in India over to the trust to run a day care center in her late brother’s name. Meera Trivedi is the director and treasurer of this foundation. He has practised yoga since his childhood. To him it was like a routine just like eating and sleeping. He has been noticing that the people in this scoiety can really benefit from from the practice of yoga. Hence he along with his wife Meera got trained from Patanjali yoga peeth Canada. Since early 2010 they have been conducting free sessions of Divya Yoga founded by Swami Ramdev each saturday from 9 to 11 a.m. in the Gym of Chambly Academy in St.Lambert. This is open to all age groups who wants to benefit from it. He says that the yoga is like medecine without material form ( i.e. Pills) that can cure all physical and mental diseases from their root. These yoga sessions consists of physical exercises (Asanas) and breathing Exercises (Pranayam) . Even though Vinesh’s journey through worldly happenings- education, work, marriage, children etc.- his mind was always thinking about the same fundamental questions related to soul, life after death and the existence of God. Life could not just end after death, but what thereafter? He was brought up in a conventional Hindu traditional family but from the very beginning (may be at the age of 14) he started ignoring religious rituals. Examining different religions Hindu, Muslim, Sikh and Christianity etc., he came to the conclusion that one has to rise above and beyond all these man-made religions to find real spirituality. He decided to establish a foundation. After working very hard for almost forty years in Canadian society and leading a humble moderate life, he felt ready to realize his other ambitions. He established this foundation to return what he had received from the Society for its betterment. 1. To help the needy: Mr. Saxena has compiled seven principles (see next section) which he considers a tool kit for life. It is his inner most conviction that if people follow these principles in life, they can gain complete control of their life and be happy, self sufficient beings. If, due to circumstances, one is in “dire need”, he/she can apply for assistance from this foundation. 2. Find answers to the “Unanswered” fundamental questions: This foundation provides financial or other support to promote efforts in getting answers to the fundamental questions i.e. “is there a soul”? “Is there life after death”? “Does God exist? The so-called religions do not provide answers to these basic questions. They even contradict each other- i.e. according to religious doctrines, the Hindus get reincarnated, but Muslims do not get reincarnated and Christians get bodily resurrected. What happens to communists, atheists, followers of “Jedi” etc. etc.? Religions originated at different places at different times in history to fill a void. They may be able to teach some morality, but just that. There is no scientific inquiry or universality as regards to answering fundamental questions related to soul, life after death and God. Mr. Saxena feels that is of utmost importance to obtain answers to these questions. If soul and life after death do not exist, if there is no God and we are just random happenings, then one’s attitude will be completely different than if these things do exist. Copyright © 2019 VSFFoundation.All rights reserved.